If you’ve made a mess of love and no longer understand anything... If your world is turned upside down... If you think your brain has gone on vacation... Don’t panic. 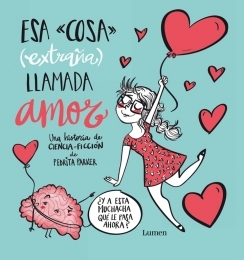 Pedrita Parker offers you the best tips, full of her good humor and great color graphics! Pedrita Parker (Estefi Martinez) is an illustrator and designer from Malaga Spain. Very active at the social networks (26.000 followers on Facebook), she designs her own merchandise, which are sold both on-line and at retail outlets, focusing on two of her biggest brands: Reina Pecas and Pedrita Parker.